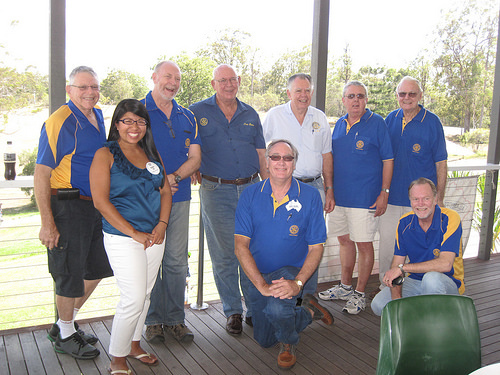 I just spent this past sunny Sunday with my host club, the Rotary Club of Pine Rivers. We dedicated the day to raising funds for the Leukaemia Foundation, one charity the club supports, with a charity golf tournament. All of the hard efforts by so many individuals resulted in about $7,000 AUD ($6,320 USD) being raised! We began the day with a welcome breakfast BBQ and nearly 20 teams had an ambrose (4-man scramble) competition where a team handicap is used. All the players tee off and the best shot is used for all the players to hit from and continues until the ball is holed. Ambrose means that a fraction of the total handicaps of the team serve as one handicap for the group. Since most teams were a 4-man team, the total would be divided by 8. While the players were on the green, I helped the Leukaemia Ladies prepare the goodie bags, raffle prizes, and auction. I really liked how they prepped the raffle because over 50 prizes were available to win so they were pre-numbered and when we drew for the number, we could continue in a very organized fashion. Rotarian Allen went around taking action shots and team photos and I helped him put them on a projector so everyone could enjoy later in the day. After everyone finished on the golf course, delicious burgers were prepared with several salads including a garden salad and pasta salad. We concluded the day with a raffle, auction, and awarding the winning and runner-up teams with trophies. It was so great to see so many diverse teams! One of my favorite teams was made up of a Rotarian’s son and his two grandsons. They were so adorable and their team won the ‘bringing up the rear’ trophy. 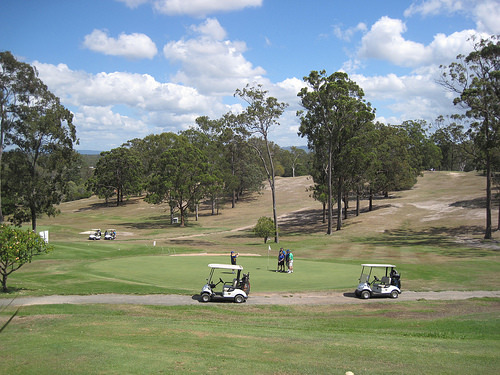 This was the club’s first golf tournament and they worked very closely with Michelle of the Leukaemia Foundation as well as the Pine Rivers Golf Club. I thought the day went really smoothly and was very fun for everyone involved. The auction was a very exciting portion of the day. It was fantastic seeing so many individuals bidding and giving to such a great cause. My cousin Jimmy passed away of leukaemia when I was very little so raising funds for this cause means a lot to me and is very close to my heart. I was so happy that the club let me volunteer and hope that this becomes an annual tradition with the Rotary Club of Pine Rivers! Thank you Les! 🙂 I had a wonderful time helping out and being part of this great fundraiser. Can’t wait to see it grow in the many years to come.